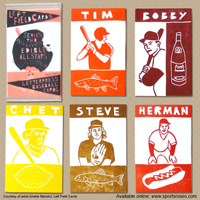 Left Field Cards are a creative and artistic take on traditional baseball cards by French-born artist Amelie Mancini of Brooklyn, NY. 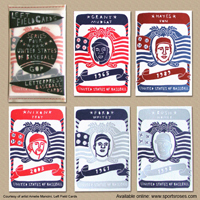 Mancini takes the commons out of baseball cards by focusing on all the uncommon traits and facts of baseball players from baseball's rich history. 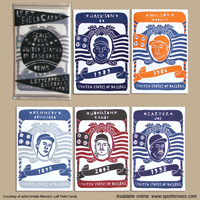 A player doesn't have to be household name star like Babe Ruth or Ted Williams to earn a place in Mancini's Left Field Cards. If she can find an obscure or intriguing fact about a player, they'll have a chance to make it into one of her unique collections. Share a last name with a fruit or a president? Have a curious 2nd career? 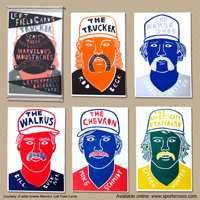 Sport a marvelous moustache? Land a spot on the DL caused by a bizarre injury? These are just a few of the curiosities that have struck Mancini's fancy in her Left Field card collections. 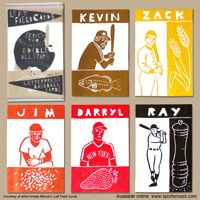 Left Field Cards are printed by hand on a letterpress using premium, postcard-size card stock. 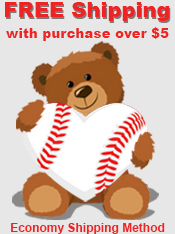 And instead of player stats on the back, you can add a note, address and stamp to send a special thought to another baseball fan. 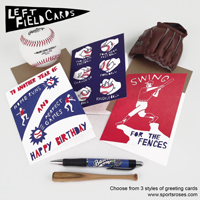 Left Field Cards are available in packs of 5 cards with several different themed series to choose from. Collect them all!